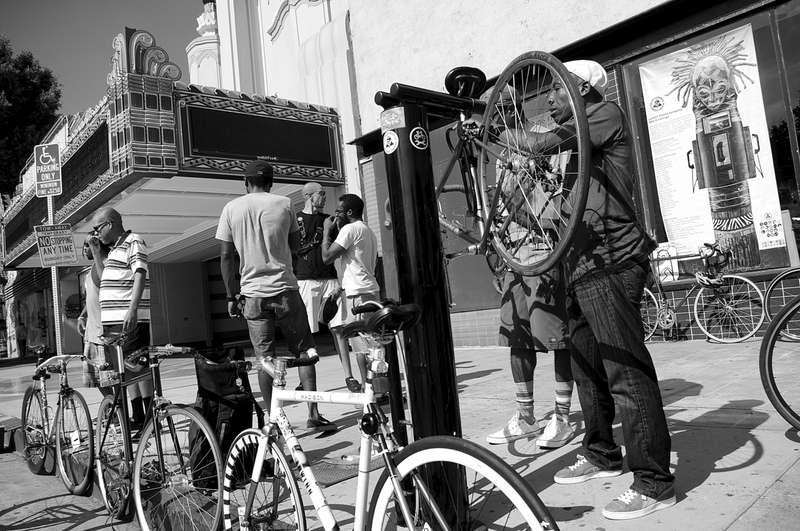 Ade Neff puts his bike up on the stand at the repair station near the Vision Theater in Leimert Park as members of Black Kids on Bikes gather for their monthly ride. BKoB members will be set up here to help repair bikes on Sundays. Sahra Sulaiman/Streetsblog L.A. Rain, rain stay away. Come again some other Sunday. This Sunday, December 7, from 9 a.m. to 3 p.m., South L.A. will host its first CicLAvia and there is simply too much awesome stuff planned for the rain to make an appearance. As you hopefully know by now, the route for this year’s event is anchored in two of South L.A.’s more historically significant and vibrant neighborhoods. And while they are vastly different — Leimert Park is in the throes of an African-American-centric artistic and cultural renaissance while Central Ave., situated on the edge of Historic South Central proper, is now a majority-Latino community and is diligently moving forward on creating a Business Improvement District to spur economic growth along the corridor — both communities are taking the mission of helping residents and visitors alike see their neighborhoods with new eyes very seriously. Both are also connected by Martin Luther King, Jr., Blvd. 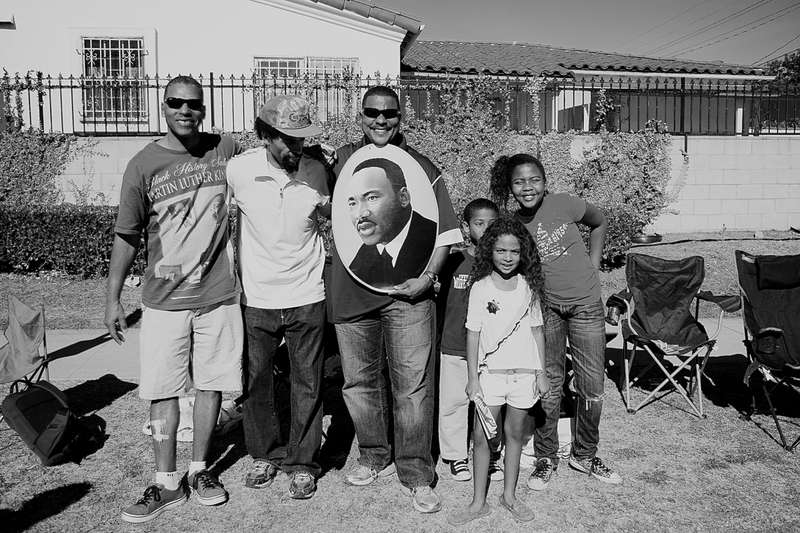 — which hosts the annual King Day parade every January and is flanked (on the Leimert end) by 40′ high pine trees, which were planted in honor of Dr. King. Families along Martin Luther King Blvd. celebrate at the King Day parade last year. Sahra Sulaiman/Streetsblog L.A.
As I mentioned in yesterday’s overview, because South L.A’s greatest assets are its people — their unique identities, heritage, experiences, cultures, artistry, and aspirations, the day is going to be about much more than riding bicycles. Consider the following list (and CicLAvia’s downloadable pocket version) your formal invitation to get off your bike at a hub and stay a while. The Royal Queens serenade the Plaza at 43rd Pl. in Leimert Park at a recent art walk. Sahra Sulaiman/Streetsblog L.A. 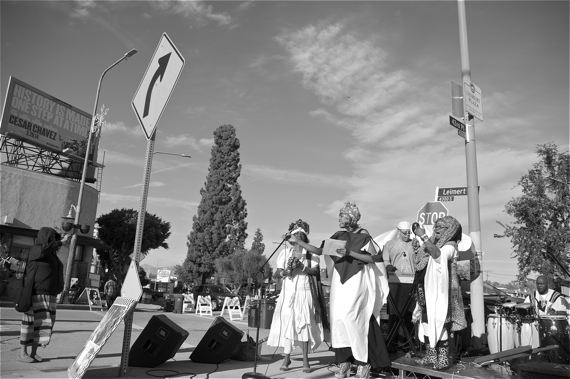 Despite South L.A. being the one route denied funding from Metro’s open streets program this year, the artists, advocates, organizers, and stakeholders have managed (with the help of some funding from the Department of Cultural Affairs) to pull together an outrageously impressive line-up of entertainment. Senorah Sam, Ade Neff, and other volunteers chased after performing artists, business owners, and vendors to ensure the stages, plaza, park, and surrounding businesses, galleries, and performance spaces were popping with entertainment. Sika, master jeweler, shop-owner, and co-founder of the African Arts & Music Festival, worked to fill Degnan Blvd. (perpendicular to the hub at 43rd Pl., see map above) with music and vendors reflective of the African-American community and African diaspora. And members of the Black Kids on Bikes, who do monthly rides out of Leimert Park, will be volunteering to help the nascent Ride On! 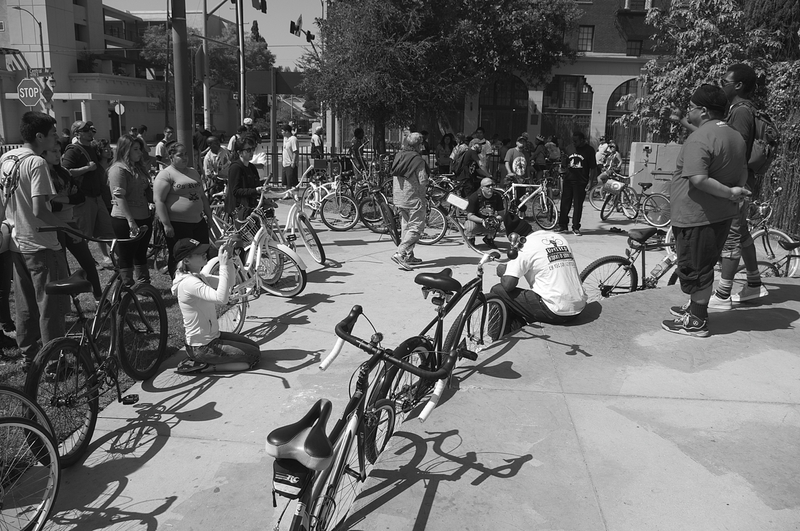 bike co-op Neff is working on tune up bikes that may need a tweak or two to be ready to ride the route. Visitors to the hub (conveniently located a few blocks south of the Crenshaw stop on the Expo Line) are invited to visit the stages, do yoga, learn about the healing arts on the plaza, sample food from the local vendors and food trucks, sing karaoke at the Regency West, or pick up a community map and explore on their own. 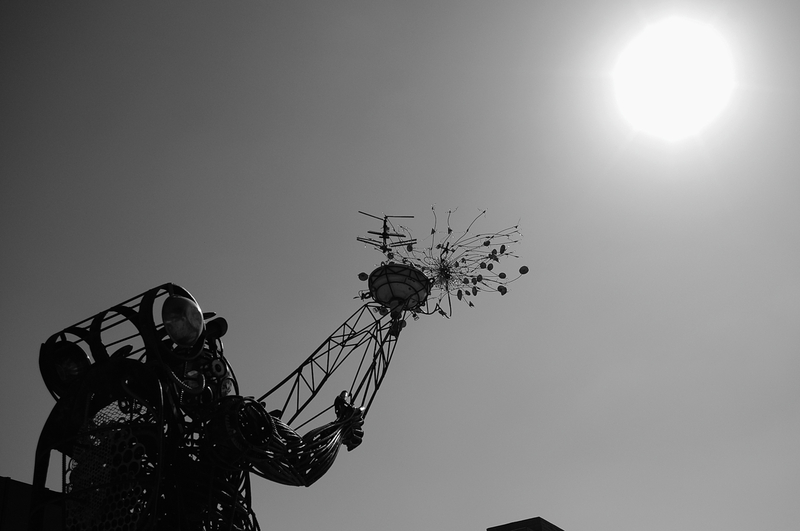 “Wishing on a Star” by Charles Dickson is an eco-kinetic sculpture that sits outside the California African-American Museum, one of several facilities that call Exposition Park home. 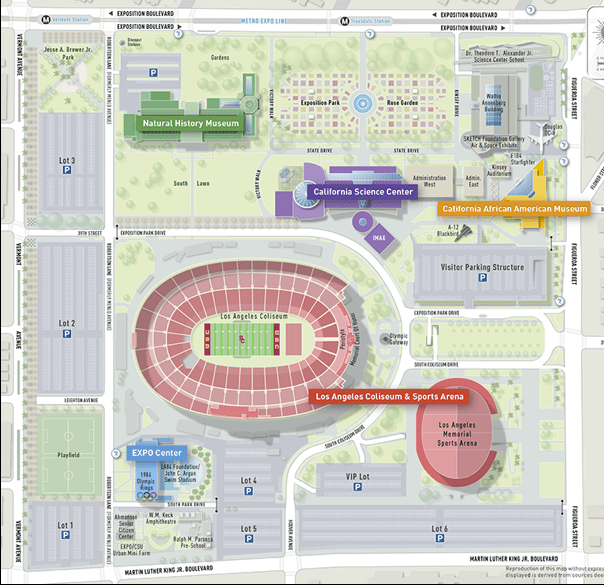 Sahra Sulaiman/Streetsblog L.A.
Exposition Park — home to the Coliseum, a gorgeously fragrant rose garden, wonderful museums, and the Space Shuttle, the EXPO Center, and easily accessible via the Expo Park/USC stop on the Expo Line — will be the site of an active hub. In honor of the 10th Anniversary of the EXPO Center, it is presenting its Winter Wonderland Festival in collaboration with the California African American Museum’s (CAAM) Target Sundays celebration. Exposition Park. 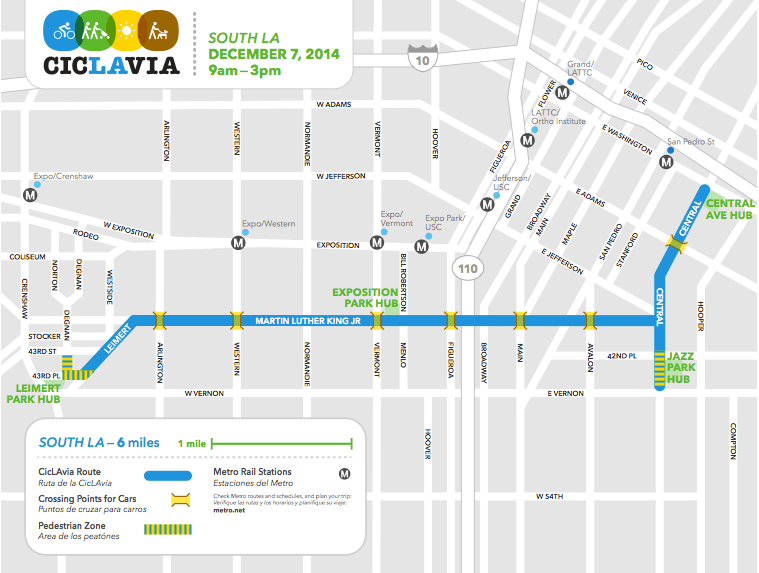 CicLAvia will run along the south edge, and the festivities will take place on Bill Robertson Lane, which runs on the west side of the Coliseum. From 9 a.m. onwards, the combined festivals will feature snow (snow!) on the soccer fields in front of the EXPO Center (along Bill Robertson Lane), pictures with Santa, performances celebrating Kwanzaa, music, and food vendors. As it is also the 73rd anniversary of the attack on Pearl Harbor, the day’s events will include taking a moment to remember the fallen. Community Services Unlimited, Inc., healthy food and food-justice advocates-extraordinaires, will be doing cooking demonstrations nearby, at the site of their urban farm and weekly produce stand (the corner of King and Bill Robertson Lane). Stop by and check out what’s in season, learn about upcoming workshops, and sign up to receive their weekly bags of organic produce. Visitors are, of course, also invited to check out the museums. CAAM opens at 11 a.m. and is free to all. Current exhibitions, found here, include a series of courtyard installations by female artists of color, From Women’s Hands, and another entitled Visibly Invisible, which depicts the struggles of people of African heritage with albinism in Tanzania, Jamaica, and the U.S. 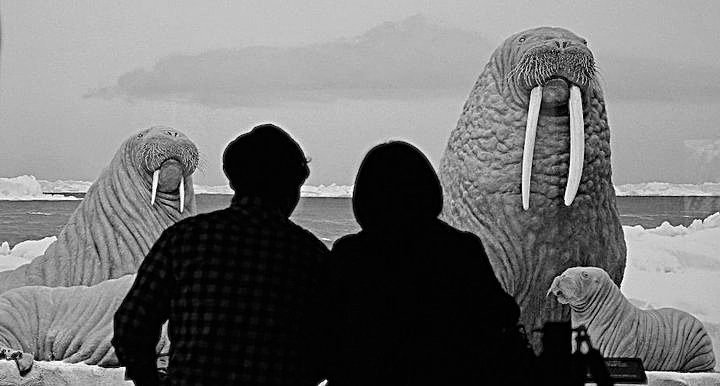 Observing the observers at the Natural History Museum. Sahra Sulaiman/Streetsblog L.A. The beautiful Natural History Museum is full of amazing dioramas and other wonderful things that make learning lots of fun. It’s open from 9:30 a.m. to 5 p.m. and is $12 for adults (less for kids, students, seniors). And the California Science Center, home to the Space Shuttle Endeavour, is also open from 10 a.m. to 5 p.m. The permanent exhibits are free. Special exhibitions are not, and if you missed the Shuttle when it inched its way through South L.A.‘s streets in 2012 and want to see it Sunday, you will need to make a reservation. Andres Ramirez Huiztek and Tafarai Bayne talk about the history of Central Ave. and the Dunbar Hotel at the Jazz Park. Sahra Sulaiman/Streetsblog L.A.
Central Avenue will be closed between Washington and Vernon on Sunday. The closures will help folks get back and forth to the nearby Metro Blue Line stops (at San Pedro and Vernon/Long Beach Bl. ), in the event people are coming from outside the neighborhood. And it provides an opportunity for people to get to know a historic stretch of the community, pick up something yummy at one of the local restaurants, Dancelavia with the Bodacious Bike Babes at Central and King, or wander slightly west to participate in a Free Lots! activation of a vacant lot. The hub on the Washington end will feature a Kids’ Zone, Mobile Mural Lab, a bike safety skills course, and giveaways. On the Vernon end, you can listen to music from acts featured during the Central Ave. Jazz Festival, and tours of the historic Dunbar Hotel provided by the good folks at the Coalition for Responsible Community Development. The hotel recently reopened as senior housing after being beautifully restored with musical instruments and memorabilia from its heyday. Some of the seniors living there happen to be former musicians with both long memories and a gift for gab; they might be able to tell you a thing or two about what the Dunbar and the corridor mean to them, if you ask. And, because CicLAvia is about making sure there is something for everyone, you can also get your nerd on at the Mayor’s #techLA Hub. The Hub is meant to give future coders and inventors the chance to interact with what the Mayor’s Office bills as “the most exciting technologies being developed in Los Angeles today.” In addition to free sessions on web design, Photoshop, film editing, and coding, you are invited to participate in a CicLAvia Treasure Hunt — an interactive contest to digitally map the cultural assets found along the South L.A. route. Why an after-party? Because riding bikes often makes people feel like this. 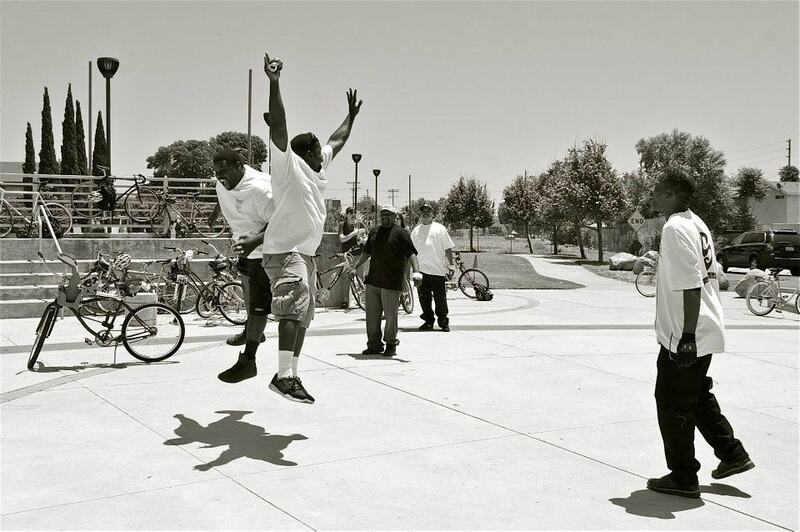 The co-founders of the East Side Riders jump for joy at the Watts Towers. Sahra Sulaiman/Streetsblog L.A. Which means the nights are long. So, you might as well get your party on early. Listen to music, dance, and rub elbows with some of the folks that have been so dedicated to making a South L.A. event a reality. More information can be found here.